I wonder what would happen if white members of the Trade Union Unison were to put out a leaflet announcing a "White Members Group Meeting"? They would be expelled the trade union and damned as being "racist". 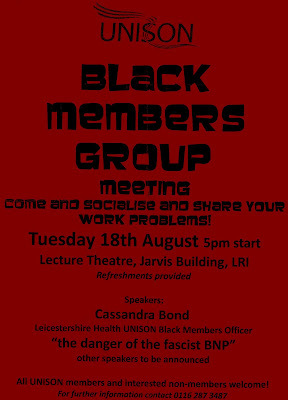 So any white Unison trade union members like to try and hold such a meeting? Protest will soon be made illegal. So where as Nick Griffin MEP BNP gone? Will the real Anjum Alam Khan stand up. Trevor Phillips Declares War on BNP! A quick word about the new GA site. Right that is enough dirty washing done. Plaid Communist unhappy - WHO CARES? The Nation with an handle on its back! Soldier’s Mother banned by Post Office ! Cardiff Soldiers Mother Banned By Post Office! From the Eyes of an RWB Witness. No helipcopters for Afghanistan - why? So who really impressed you at the RWB? How can anyone take these red critters seriously? WE HAVE LIFT OFF ..... !!! !